Choose love… Random events are beginning to exhibit some clarity. Obfuscating clouds are parting, and a higher understanding of life’s meaning is beginning to settle into your awareness. Yet you hold onto to what is dear, what is familiar, what is comfortable. At this moment of dimensional bleedthrough into your everyday world, examine the reasons why you are where you are, what you are clinging to, and why you are holding on to it. Be it a person, a set of beliefs, a way of living, an idea, there are reasons for your innate need for its presence. If it is not love, what then is it? If it is not love, why do you choose it? These are the kinds of questions the moment demands of you. Within the framework of your perspective, you find comfort in that which has thus far supported you. What you have nurtured into a living tandem bulwark within a world of well-hidden thorns has brought you in relative safety to this point. Now that the light is shifting, you’re beginning to see things anew. What thoughts are rising in your mind, as you allow the eyes of higher mind to look through you, penetrating your reality with a gaze from beyond the confines of your own frame of mind? In what you see now, can you discern a divine hand, a higher thought, the design of love’s grace? In what you see, can you choose love as the outline of truth? You may be confronted with some uncomfortable divisions of the rays of light. How you choose to see will make all the difference in the world. Yet you may enjoy the sweet knowingness that you have done well to build your world according to the best principles and practices you’ve had available to you. Your own creativity, within which you stand, has crafted the form of all that has come to be of beauty and meaning. If recent (or soon-to-come) revelations leave you feeling unsettled, remember that you have a choice as to how you position yourself vis-a-vis all probabilities and potentials. Choose love. Where it is difficult to discern love’s whereabouts, remember that your own mind is an echo of the divine breath that lives in all sentient beings. This breath breathes love into being, enlivening the mind and inspiring the heart to call love into being likewise. Love will answer. Reach for it. Rooted in the essence of Nine, this post focuses awareness on the three-card spread of this week’s Pleiadian Tarot message. 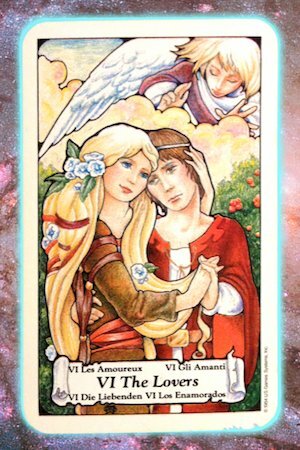 Nine’s Path Pleiadian Tarot messages are posted every Thursday, with a follow-up single-card reading for keeping on the path posted the following Monday. Join a discussion of Pleiadian tarot posts at the Transients.info Roundtable Forum. Rate, share, and comment below!